My eyebrows have faded to almost nothing. This eyebrow kit is the best. It does not look like you've colored in your brows. Great product that I use even at home. When I first started filling in my brows I bought this. Spiked matches well with my eyebrow color, no issues with smearing or running and no irritation to my skin. I love Mac and would buy this again but a cheaper alternative is define a brow by Maybelline it's a fraction of the price. For SURE my HG eyebrow pencil. My eyebrows used to be in a pretty bad shape (.....literally speaking) because I w...read moreent pluck mad. Learnt my lesson, but in the meantime this was my saviour. It fills in smoothly, is easy to control and doesn't go on 'heavy' (although this can be done if you don't have a light hand). I love how it's self-sharpening, really useful not having all the fuss. ONE thing - it doesn't last long, especially if you use it to fill in most of your brows. Because mine have grown back I only use it to create longer brows, filling in the ends because the hairs are quite fine and I like them somewhat thick at the start but end thin. Another thing is that sometimes the twisty part comes off but you can simply slide it back on - just a bit annoying. Totally recommended, smooth application and matches my eyebrow colour to a T. So happy with MAC!! Yet again. I have only two complaints about this brow pencil. I have black brows, but we all know using an actual black pencil is just not generally a good idea. I try to opt for a greyish dark brown. This one is just a little too reddish brown. I'd prefer a slightly more grey tone, but this still works if I use a light hand and blend well with an angled liner brush. Secondly, I wish the pencil would roll back down into the tube so I could estimate how much I have left, but it only works one way. Apart from that, this is a great product for brows, I like the consistency, stays put (no odd smearing, even with my oily skin), and I appreciate any pencil that I use daily that doesn't require sharpening. I LOVE this little pencil. This has become my holy grail brow product!!! i have dark brown hair and dark eyebrows and Stud matches my eybrows perfectly. The narrowness of this pencil allows me get precisely stroke on tiny brow hairs where i might have some patches from a tweezing gone wrong. I LOVE everything about this except the price which imo could be a little lower, but i'll keep buying this because it is perfection. Simply amazing. This pencil doesn't smudge, doesn't fade and lasts me a few months of use! I have sparse eyebrows and I find that just a few whisks of this bad boy makes my eyebrows look perfectly manicured. Prior to finding this little gem I was using drugstore brands and was embarassed more than once to find out that half my eyebrow was missing... Mortified I searched for an alternative and have never looked back since. This particular shade is great if you color your hair black like me as its a very dark brown and looks more natural than a full out black pencil. Thanks MAC, you never disapoint. I have used this twist up pencil in both Lingering and Spiked. Lingering is the better match for me of the two, but it has too much red in it. In pictures my brows look totally auburn, even though my hair is more ash brown. It's just such a shame that MAC doesn't make these little pencils in more colors. I love the precision you get with this pencil because it is so thin. The formula is also ...read morequite nice and creamy, making application a synch. It does bother me that you can twist these up, but not down. You can never tell how much product you have left, and these go fast! If you use this regularly like I was, I'd recommend keeping a spare on hand because you could be in the middle of one brow and your pencil could run out without warning. Luckily these are eligible for the Back to MAC program. 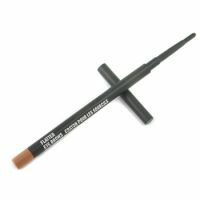 I am really fond of the formula and precision of these, but I have moved onto brow products that are better suited for my coloring.